Duke University said it's investigating reports that a black female freshman was harassed by a group of white men who allegedly shouted the same racist chant that got a fraternity expelled from the University of Oklahoma. "There will never be a n***** in SAE. There will never be a n***** in SAE." University spokesman Michael Schoenfeld told the Washington Post that Duke is investigating the incident. A junior at the North Carolina school who asked to remain anonymous, citing concern for privacy, said she was with a friend on March 22 who received a phone call from a younger student who had just been taunted with the racist chant. "She was a freshman, she was by herself, she feared for her safety, and she really needed someone to talk to," the junior told The Huffington Post. The junior says she's affiliated with a "group of concerned students" that is working to raise awareness of what they call a hostile campus. She would not provide the name of the group, but said its members are in touch with the freshman who was taunted. Students are talking. 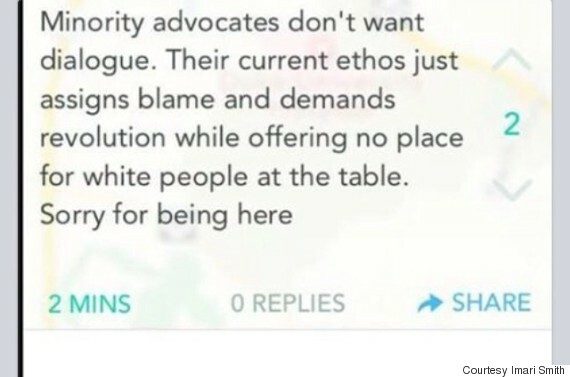 On Wednesday, an anonymous group called the Duke POC Caucus posted a statement to a newly formed Tumblr account, alleging the incident was part of a bigger problem at the school. "The racist terror to which the young black woman was subjected is symptomatic of systematized racism," the statement reads. The group also mentions a Duke fraternity's controversial Asia Prime party. On Thursday, Duke's Black Student Alliance (BSA) launched a Twitter campaign called #WhatWeNeedFromDuke, asking students to tell the administration what they need. Other students used more traditional means and stuck notes to the BSA's walls. 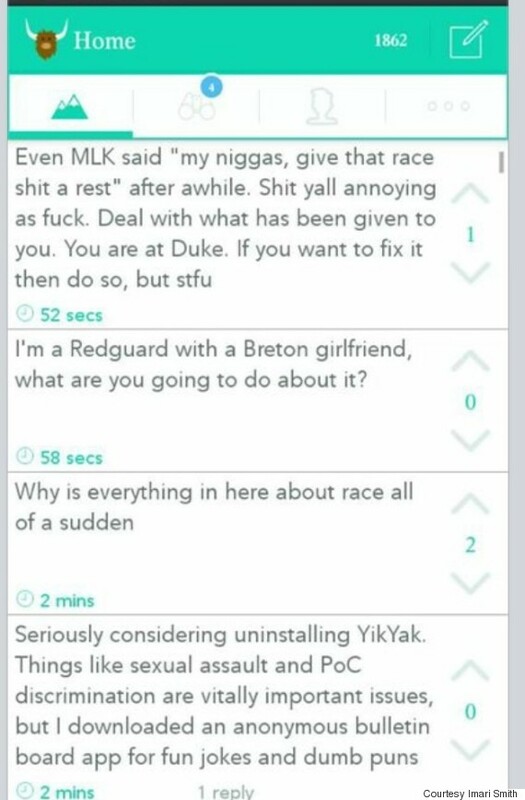 Imari Smith, a junior at Duke, has compiled what she says are screenshots of some of the messages posted on Yik Yak, an anonymous, local messaging app, in the wake of the alleged incident. Calls to Duke's Office of News and Information, the Office of Public Affairs, the Vice President for Student Affairs and the Duke University Police Department were not returned.